Home Fire by Kamila Shamsie cleverly mirrors the times we live in. No pun intended, as I actually found 13 reasons why everyone should read this book. Kamila shamsie has really matured as an author in this book. The storyline is strong and intense. Characters are very well-researched with in-depth personality descriptions which make it believable. Home Fire highlights the issues of immigrants – mirroring the times we live in. The similarities between Antigone and Home Fire are on-point, and relevant. The romance between Eamonn and Aneeka is not only unusual; it adds cohesion to the novel. Pervaiz’s plight highlights the issues of Jihad/terrorism, and also of the dangers of teenage folly. To comprehend the far-reaching effects of politics. The struggle and rise of Karamat Lone and his internal battle with his Muslim background and a secular front was highly reminiscent of Sadiq Khan, the famous Mayor of London. Home Fire is very relevant to our times. The ending! She ends the book in a manner that will stay with the reader for a long time, if not forever. However if you want to read a detailed review, we can do that also … so go ahead and discover more! 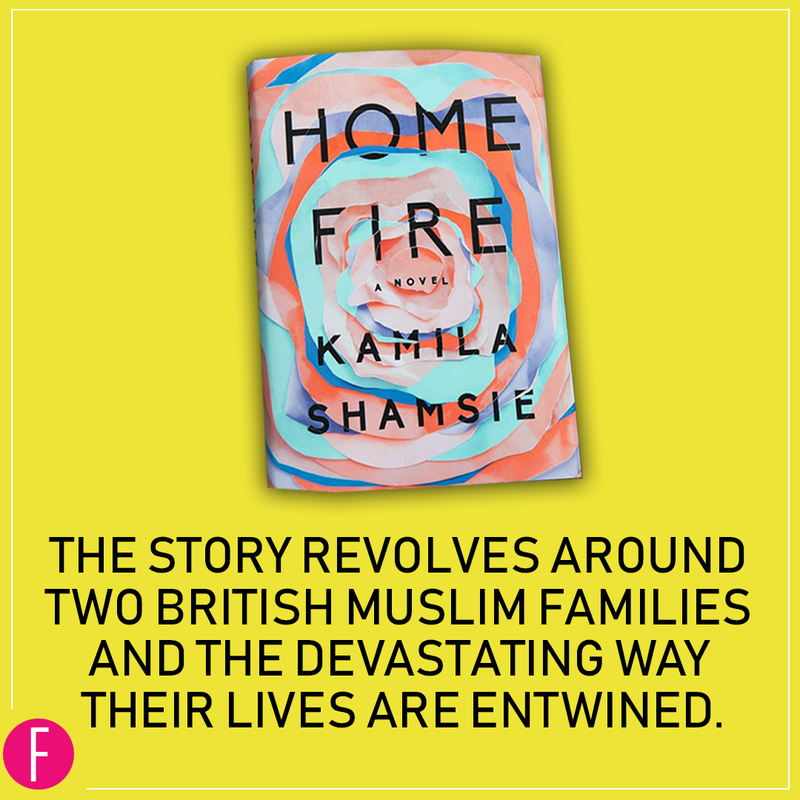 Kamila Shamsie’s Home Fire cleverly mirrors the times we live in. The story is about Muslim lineage, Jihadi Camps, and having to maintain a secular front in today’s religiously controversial world. The prose is both beautiful and intense. Kamila Shamsie’s seventh novel is a clever and true adaptation of the Greek play, Antigone. Home Fire is about love in its different forms, and how far a person can go for the ones they love. Keeping up with her previous themes of inter-twining love, politics and fate, she cleverly adapts the Greek play by Sophocles into this well-researched and relevant storyline, with well-thought out characters and a strong plot. All chapters are named after different main characters, giving a clear and concise picture inside their minds, while the story unfolds with fluidity. The story revolves around two British Muslim families and the devastating way their lives are entwined. On one hand are the siblings, Isma, Aneeka and Pervaiz, who attempt to live the life of moderate Muslims in London after being labeled the children of a terrorist. While on the other hand is a family who has long renounced its religious affiliations and has climbed the social and political ladder. Eamonn is the handsome and privileged son of Karamat Lone, the most powerful Muslim politician in Britain. 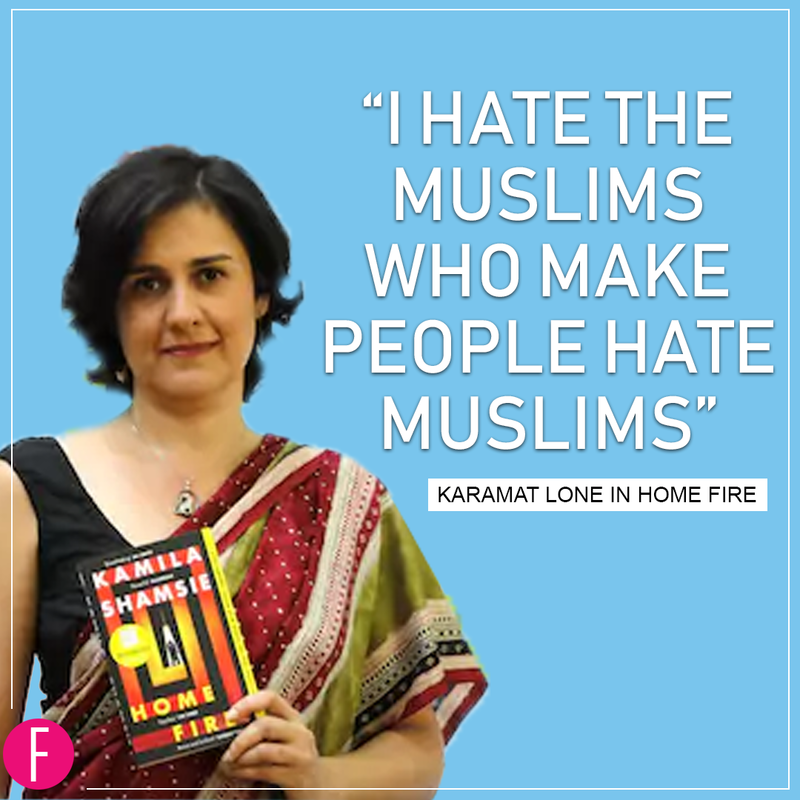 ”I hate the Muslims who make people hate Muslims” was the philosophy that Karamat Lone lived by. But fate had plans to test his mettle. Isma tried to protect her younger twin siblings from the stigma of their father, but Pervaiz fell for the illusion of jihadi grandeur and went astray. When Eamonn entered the life of the sisters, Aneeka saw salvation for her brother in him. Putting aside her religious beliefs, she chose a perilous path of pretense and enticement. But love, in all its forms, is a force to reckon with. And this dangerous game not only tested her love for her brother but that of Eamonn for her, and Karamat’s for his son. Shamsie also highlights the bleak conditions of Jihadi training camps and the double standards that make it a mockery of religion. Her description of Pervaiz’s mien and the repercussions of his training are woeful and melancholy. “He had survived the tedium of Shariah classes in which he learnt that everyone he knew was either an infidel or an apostate and that both categories deserved to die, and that it was against Allah’s will to wear T-shirts with slogans on them, or allow your women to sit down in public … That piece of information had made him blubber into the pillow at night, not because it made him understand that his father had never loved him but because he finally saw that he was his father’s son in the abandonment of his family who had always deserved better than him”. Kamila Shamsie has been awarded 2017’s £10K London Hellenic prize for Home Fire, which celebrates “The cultural cross-fertilization of the Greek and English-speaking worlds”. A well-deserved win, as she astutely adapted a play written in 441 B.C and made it pertinent to the modern day world. Home Fire was also listed for the 2017 Man Booker prize.